This is the eighth and last post in the Montreal Jazz Festival Weekend series. Other posts include New Series! Montreal Jazz Festival Weekend, L’Express Montreal, A Tour of Montreal Bakeries and Bagel Shops, Lawrence, Market Jean-Talon and Mont Royal, Patati Patata, and Hotel Herman. It’s unquestionable. 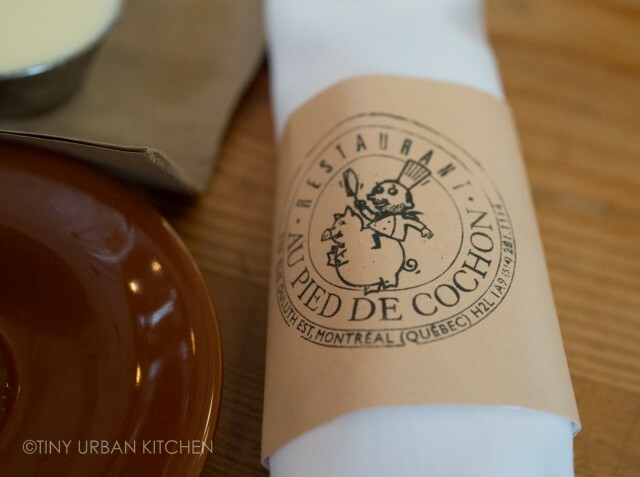 Au Pied de Cochon is one of the most famous restaurants in Montreal. Yet, despite my numerous trips to Montreal, I had never visited this restaurant. Being a solo traveler to Montreal, it just never made much sense for me to go alone. Until this past summer, when Bryan and I decided to eat our way through Montreal with two other friends. Finally, I could come and try this crazy famous place and see (and taste!) for myself what all this hype was about. Au Pied de Cochon is insanely popular. They do take reservations, though they are hard to get. We could only get a 5:00PM reservation, and we still had to line up a bit before getting seated. Despite its meat heavy reputation, Au Pied de Cochon has a very solid seafood program. The first thing we saw when we came in was the huge raw oyster bar section. Canada is also known for its great selection of oysters, including East coast oysters from Prince Edward Island and West coast oysters from British Columbia. The menu is essentially divided up into small starters, slightly larger appetizers, a whole separate foie gras section, and then separate sections for different types of meat. The “cochon” or pork section is the largest, though there are also offerings in the poultry section, red meat section (bison, veal, and beef), as well as a seafood catch of the day. There are several potato-based sides, such as fries cooked in duck fat, poutine, and mashed potatoes. Our waiter highly recommended the Beef Heart, which was one of the specials of the day. Oh, speaking of specials, there were TONS of specials on every part of the menu (like maybe 10-12!). I was actually quite impressed with the server who successfully memorize it all and spouted them all off in quick succession. Thin slices of beef heart came topped with a salty hard cheese and micro greens from the restaurant’s own urban garden. The greens were super fresh and crispy, and the flavors were delicious. It was an excellent dish, and I was personally surprised to see so many fresh greens on top! Now if you only have time to try one poutine in all of Montreal, this is the place to get it. They served a classc poutine with chunks of foie gras, and I have to say it’s awesome. I don’t even love foie gras, but I had to admit that this was by far the best poutine I had in Montreal. The foie gras itself does not have a strong liver flavor, which helped a lot. The gravy was flavorful and everything just worked. It’s hard to call it “balanced” when everything is so rich, but I honestly felt that the components worked really well together and that the dish was balanced in some sort of twisted, fatty, way. I was really suspicious of the faux-Japanese sounding dish called Tuna Cake (another special), which the server described as a multi-layered “cake” with a pastry crust at the bottom which was topped with rice and layers of roasted beets and raw tuna (a mixture of toro and yellowfin). The whole dish was finished with “Dragon Sauce”, a mixture of tamarind, soy, and maple syrup. Despite my wariness of this psuedo Japanese-Canadian fusion dish, I was pleasant surprised by how good it was. The dragon sauce was tasty! And the dish was surprisingly light, despite my fear of this meat-leaden place. I really liked it, and I went back for several helpings. The Duck in a Can ($44) is one of Au Pied de Cochon’s signature dishes. A duck, together with vegetables and a balsamic vinegar based sauce, are essentially boiled in a can and then opened tableside. It all goes by – literally – in a blur (my lens is too slow!). A server comes by with a can opener, opens up the can, and dumps the brown glob onto a white plate. Diners looks a bit skeptically at the contents. Despite its appearance, the dish is actually quite tasty. We were surprised that a boiled “mess” could still result in medium-rare pieces of duck. They must have truly mastered the technique. The dish is pleasant, though if you have to decide between this and the poutine, I’d go with the poutine. We also ordered the Osso Buco for Two ($50), yet another special of the day. This dish was HUGE! It really should be osso buco for at least three, I think. We made a decent dent, but we were not even close to finishing. This dish was really good, in my opinion it was tastier than the duck in a can. The dish had clearly been cooked for hours, resulting in a deep, rich sauce and tender meat. Some parts of the meat were dry, depending on its location in the pan as well as how much fat that part had. Fattier, gelatinous parts tended to fare better. All in all, it was very good. Bryan especially loved the homemade pappardelle that was served with this dish, which had awesome texture. We had to try a local favorite, the Maple Sugar Pie, which is sort of like a pecan pie but made with maple syrup and lacking the nuts. This version came topped with some ice cream, which actually balanced out the sweet, buttery pie quite nicely. It was good, though definitely sweet! All in all, I was actually pleasantly surprised. Au Pied de Cochon is worth its hype in a lot of ways. The food is very good, and they use high quality ingredients. Yes, some of their dishes are a bit crazy, and they do add foie gras to seemingly everything. However, I can’t dispute the quality of the stuff coming out of the kitchen. It’s definitely worth a visit, especially if you can find some friends to come along with you.